European Shorthairs have a strong, muscular build but is not cobby. They have short, sleek hair and are large or medium-large in size. FIFe recognizes European Shorthairs in a variety of colors and patterns. 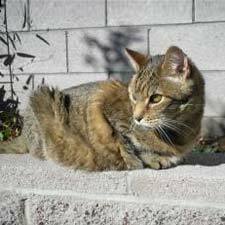 They are often seen in different tabby patterns, as well as tortoiseshell and solid colorations. Their eyes can be deep blue, amber, odd eyed (one eye deep blue, the other one amber), or green. European Shorthairs come in many different temperaments. Some are quiet and laid back while others are active and playful. This is the result of the European Shorthairs ancestry, which included cats of many different dispositions. Their coats are easy to manage, and only need to be brushed about once a week. European Shorthairs are rare in the United States and can be hard to come by. It’s difficult if not impossible to predict the temperament of a European Shorthair. Each cat must be judged individually. The European Shorthair goes back to cats that lived in Rome during the time of the Emperors. As the Romans spread their culture throughout Europe, these cats went with them. Modern breeders in Sweden began deliberately crossing attractive yet unpedigreed cats in an attempt to create a breed that harkened back to early Roman origins. The result was the European Shorthair. The European Shorthair is not recognized by any of the U.S. cat clubs, but is accepted by the Federation International Feline (FIFe). It is very popular in Finland.